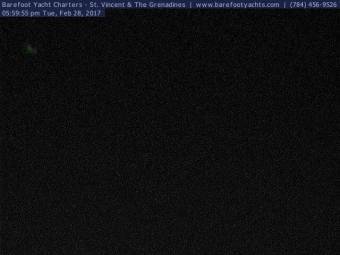 It's 22:51 in Kingstown, Saint Vincent, Saint Vincent and the Grenadines right now. Blue Lagoon Bay A view onto the Blue Lagoon Bay from the Barefoot Offshore Sailing School. St. George's: HD Stream Beach, 83.4 miles away. Grand Anse Beach: Native Spirit Scuba on Grand Anse Beach, 86 miles away. Saint-Pierre: Seaview, 111.6 miles away. Tartane: La Caravelle, 114.3 miles away. Ragged Point: Cloud Observatory Barbados, 118.8 miles away. Carnival Fascination: View from the Bridge, 134.3 miles away. Maraval (Trinidad): Weather in Maraval, 169.7 miles away. Port of Spain: Weather in Port of Spain - FortGeorgeMon, 171.3 miles away.